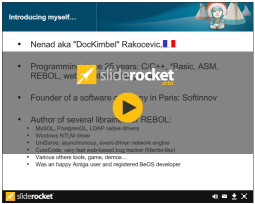 Cheyenne aims to be a full-featured Apache-class web application server implementation using the REBOL programming language. Cheyenne is built on top of our UniServe async network framework, so Cheyenne's kernel inherits the gains of asynchronous I/O and mono-process lightweight design, while being able to spawn worker processes to dispatch the load for heavier requests. So, Cheyenne has good scalability making it suitable for small or medium sized web sites. 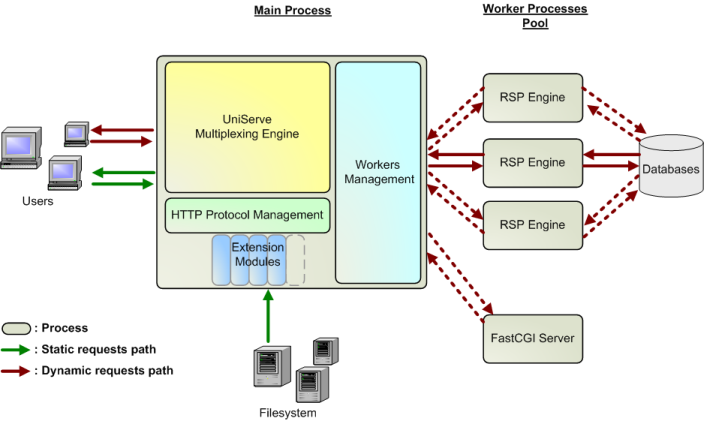 It can sustain the load of up to 500 requests/sec on servers with dual-core CPU. It's still on beta stage, but it has reached a good level of features and stability, so it's already in use by several companies (including our own) and private users. The Syllable operating system has adopted Cheyenne on its server edition. Besides providing a REBOL-based production level web application server, Cheyenne can be a good choice for a small, fast, personal web server. In order to achieve that, we're releasing free Cheyenne binary versions for Windows, Linux and OSX platforms in addition to the raw source package. HTTP/1.0 and 1.1 protocols supported. Persistent connections for HTTP/1.1 and Keep-Alive support for HTTP/1.0. Browser cache management (headers: If-Modified-Since/Last-modified). Chunk-encoding transfers support (streamed data transfers for RSP). Memory caching for static pages. Full support for virtual hosts. Support for a wide range of OS (Windows, OSX and most of UNIX variants). Requests cut in phases for modular architecture (Apache-like). mod-static : core features and static file handler. mod-alias : aliases and redirection support. mod-ssi : server side includes support. mod-action : dynamic handlers executed in background processes. mod-rsp : REBOL Server Pages support. mod-userdir : cheyenne's exe runtime user and group rights settings (for unix). mod-upload : query server for file upload progress in real-time. mod-fastcgi : third-party applications support thru FastCGI interface. mod-extapp : launch and control third-party external servers. mod-embed : easy Cheyenne integration in any REBOL app. mod-socket : web sockets application framework (alpha). Configuration file with dedicated and expandable dialect. Update configuration in live without restarting the server. Support for "kill -HUP" UNIX signal for reloading configuration. REBOL CGI support with persistent processes (FastCGI performances). General CGI support (run any CGI script). WebApp container: web application framework. Complete API with dozens of useful functions built-in. SQL queries results transparent caching. Can be controlled from system tray icon and menu. Can run as a Windows Service and switch back to user mode from systray. Cheyenne and UniServe source code are published under BSD open source license.